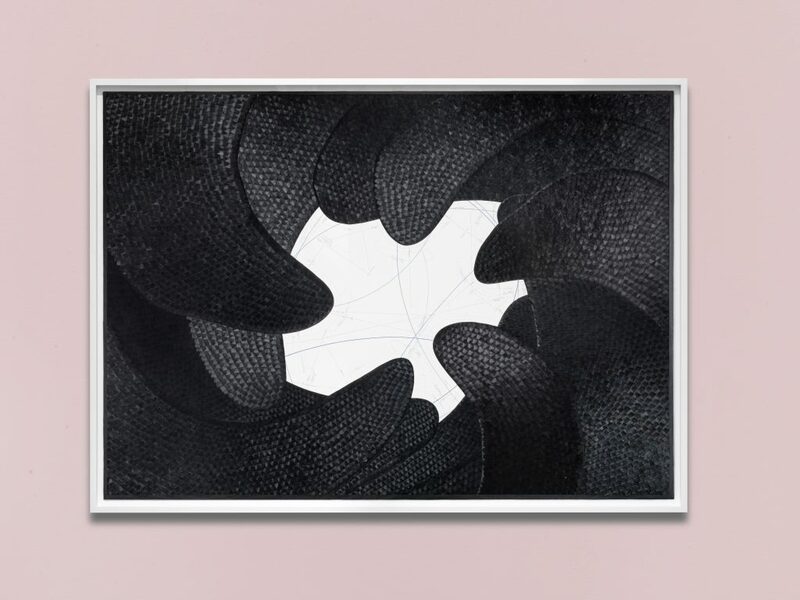 KÖNIG GALERIE takes great pleasure in presenting its second solo exhibition by the Berlin-based artist Jorinde Voigt (b. 1977) and Voigt’s first individual show in the premises to which the gallery moved in 2015 – the former St. Agnes Church, built in 1967. Since the mid-2000s Jorinde Voigt has developed a highly idiosyncratic graphic system for the visualization of experimental arrangements, experiences of reality, thoughts, sensory impressions, philosophical writings and music – a system which she is continually developing and expanding through the addition of new elements. Voigt translates the objects under investigation into a grammar of her own, which then finds expression, sometimes as meticulously drawn systems of lines and script, sometimes as turbulently dashed specks of paint, coloured collages or gold leaf inlays. 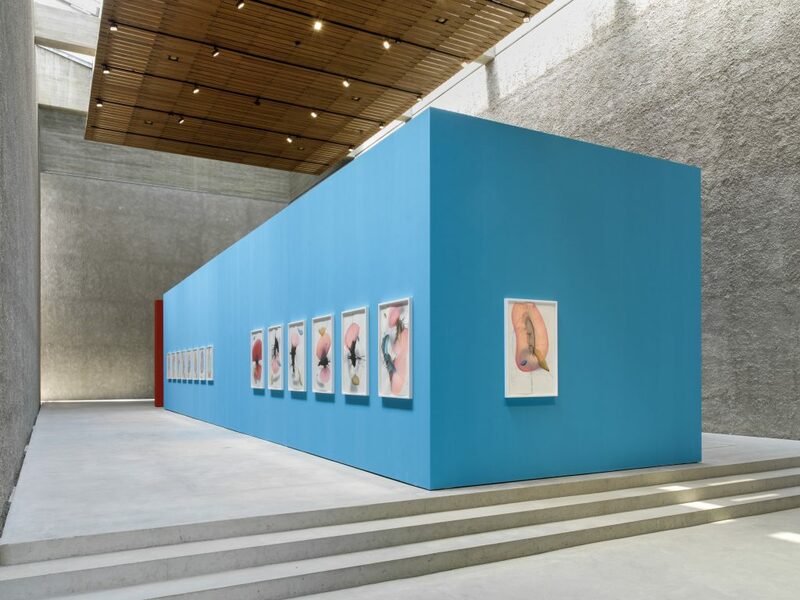 She makes no distinction between abstraction and figuration, between the regularities of an algorithm and the spontaneity of freehand drawing, but rather, she explores the two poles of these supposedly rigid opposites within one and the same drawing, allowing things begun with precision and exactitude to shed all restraint in an unforeseen gestural fling. 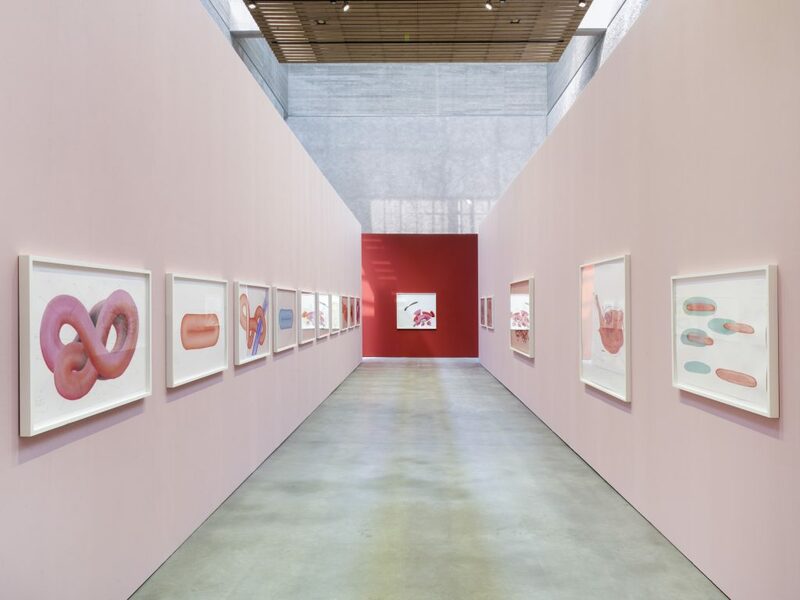 Her complex thought models can be read as the personal depiction of a reality conveyed via stages of re-forming, abstracting, translating and processing. They offer information on one’s own and other people’s perception of images. 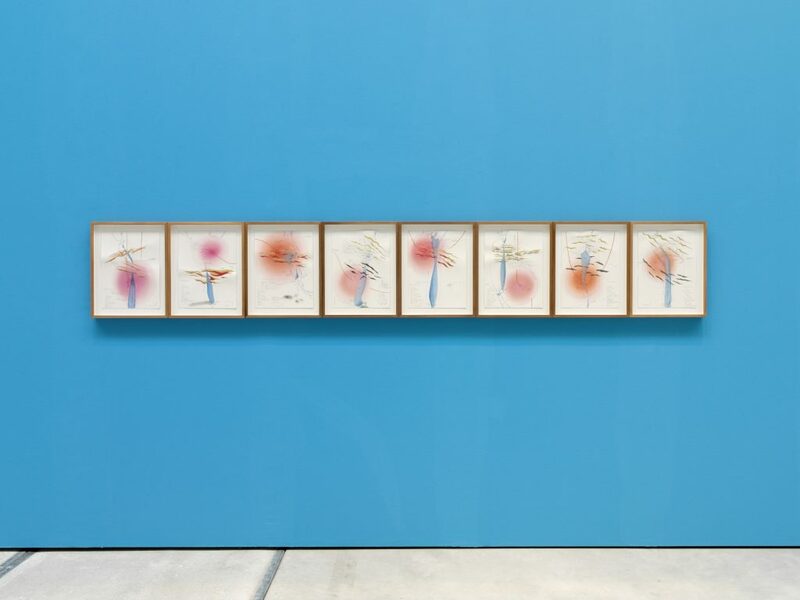 Voigt’s drawings always remain subjective; the process of treating what has been seen, thought or read takes place in the act of drawing itself. 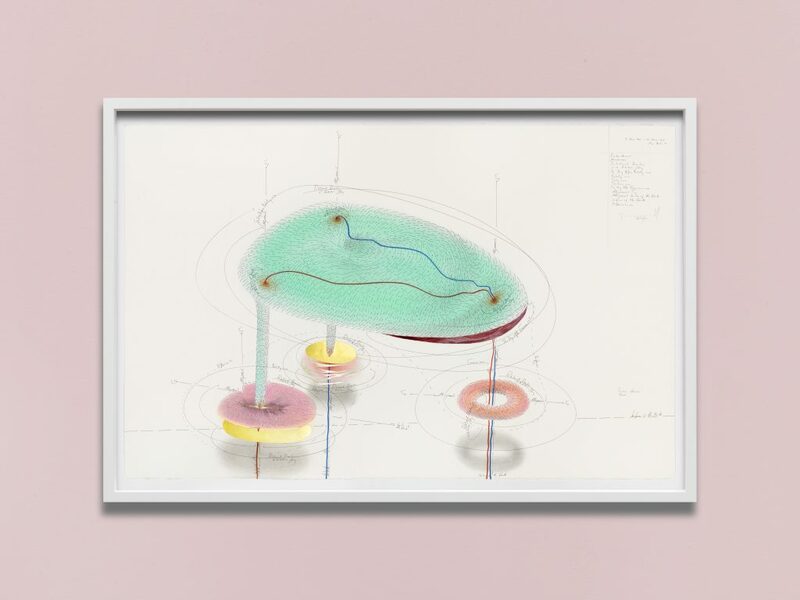 Using a kind of notational mesh of lines, arrows and writing, which give pointers to movement, spatiality, the present, the future and infinity, Voigt endeavours to locate the compositions she has put on paper within a seemingly objective and analytical system, which she terms a ‘matrix’. At the same time, the continual shedding of restraint and the infinite possibilities of perspective enabled by this system bear witness to the unstable, vertiginous forces at work in the far-flung expanses between perception, cognition and visualization. The objects under Jorinde Voigt’s observation, to which she devotes herself for the most part in self-enclosed groups or series of works, can be tangible things, such as a particular text or cultural or natural object. 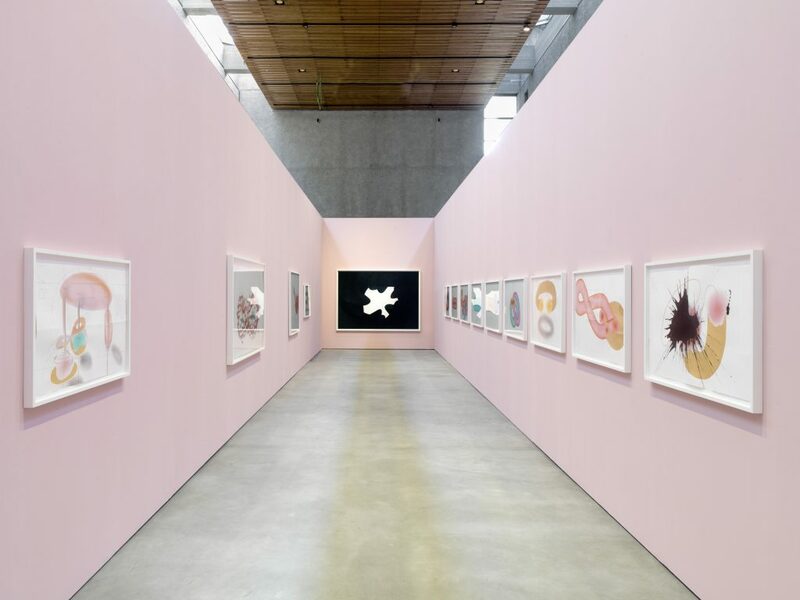 In Voigt’s more recent works however, the starting point for her compositions are wholly etiological processes of perception, apprehension or image- and form-finding. She is increasingly concerned with a search for the innate constitution of inner and collective images – of archetypal forms. In the series Ach so! [Aha! 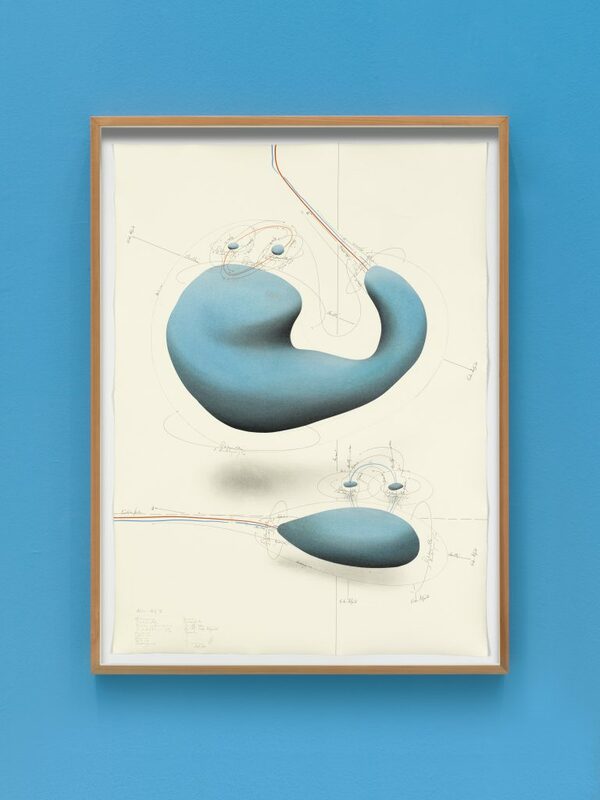 ], consisting of a kind of programmatic study, Voigt assembles numerous elements characteristic of her current work. The title of this series reflects Voigt’s sudden recognition of the organic connections between the various forms that she had already been using in other contexts. For example, there are the ‘splashes’ – spatters of blue-black ink that are evidence of the ongoing argument with the uncontrollable factor of affect in the here and now, and from which all the other elements can be derived. Equally, there are the objects she calls a ‘Focus’ – dots of fine, coloured pastel chalk rubbed in a rotating movement onto the paper. ‘Focus’ stands for the strenuous concentration, agglomeration and gathering together of thoughts, strength and paint committed to paper. All the elements have a surface, a ‘topography’, made up of innumerable arrows, allowing one to see the exterior of the objects as oscillating envelopments. Other elements of the composition are elliptical surfaces created as gold and copper leaf inlays and, in contrast to the ‘Focus’ works, precisely bordered areas made of rubbed pastel chalk that can be read as an echo or as a result of the ‘splash’. Voigt’s ‘matrix’ denotes the innate proper movements, the axes of rotation and the spatial or temporal alignments of the individual elements. Whereas in her previous works the red ‘Now’ line stood more for the concluding creation of form and the locating of all the elements in the ‘Now’. It is here not only supplemented by a blue line but also seems at times to be well and truly out to combine all the objects into one organism. The coloration of a blue and red functional supply system reveals the proximity to anatomic representations, in which arteries are traditionally portrayed in red and veins in blue. The ‘Now’ line, as it were, provides all organs with the here and now, with the present, and is the bracket holding the entire system together. The ring-shaped bodies in Ach So! – mathematically speaking, these are so-called ‘tori’, similar in shape to a lifebelt or rubber ring – were first produced by Voigt in her Lacan-Study series. 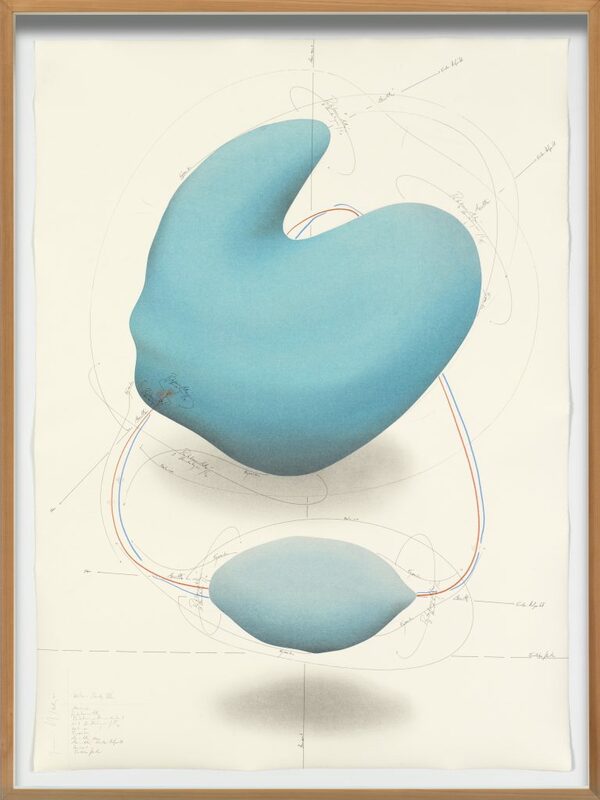 While she was playing through various sizes, rotations, positions and conditions for the tori in Lacan-Studies — sometimes separate, sometimes dovetailed, sometimes broken open – she was struck by the proximity to the thought models of the French psychoanalyst Jacques Lacan. He not only concerned himself in some detail with knot theory from mathematical typology, but also used it to portray psychoanalytical concepts such as ‘Desire’ or ‘the Imaginary’, which then prompted Voigt to name the series after Lacan. The drawing entitled Jetzt geht nicht[Not possible at present] sheds light on how Voigt works with the tori as bearers of inter-human communication. On a torus twisted to form a Mobius strip there are small speech bubbles with scraps of conversation taken from typical statements made over the phone by people under stress – statements symptomatic of the fragmentation of communication, of the continual time pressure we expose ourselves to, of our lack of time, and of our lack of any readiness to come to our senses. And, as one look at the Mobius strip as a symbol of infinity makes clear, there is no end in sight to this present. The link to Voigt’s most recent series Radical Relaxation and the one which gave it its title is Streß und Freiheit [Stress and Freedom]. As earlier in 2013, Voigt concerned herself with a text by the philosopher Peter Sloterdijk. Sloterdijk interprets Jean Jacques Rousseau’s portrayal of drifting in a rowing boat on Lake Biel as a condition of total freedom, absolute rapture, a dreamy, easeful seclusion from civilization, a rarely achieved primordial and ideal condition of man in sole communion with himself – in short, ‘radical relaxation’. 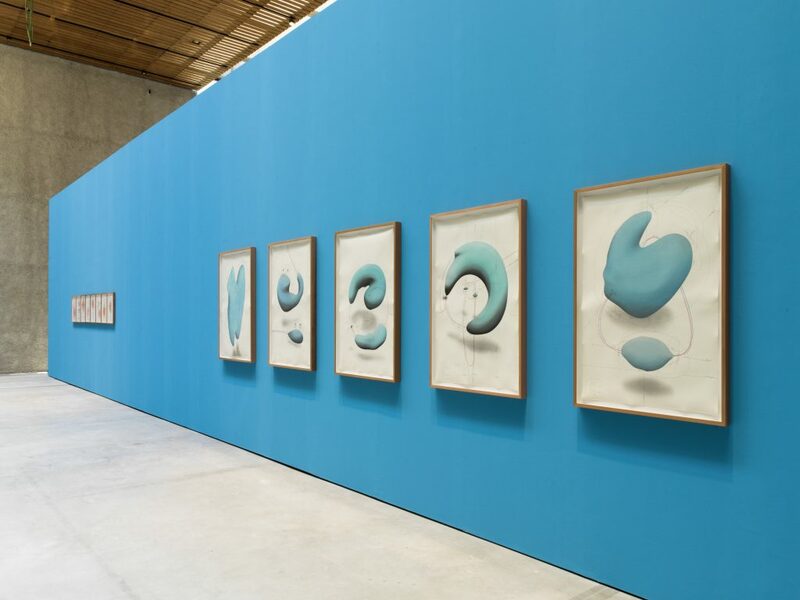 The starting points for the drawings in the series are photographs of water surfaces, from which Voigt derives the blue plane areas that dominate the works. They are created from several layers of rubbed pastel chalk blurred over one another. Here too, Voigt takes up water as a kind of cultural archetype: for her, water symbolizes not only the substance which the human body largely consists of, but also stands for reflection, (non-) transparency, continual movement allied to simultaneous calm and profound relaxation. Water can mean the ultimate in ‘freedom’ but also incredible ‘stress’ if one thinks of the destructive force or the dark threat of vast bodies of water. The forms of the blue surfaces do not always correspond to precise contours. In places they are fragmented, or have been given a three-dimensional form like that of a water drop. 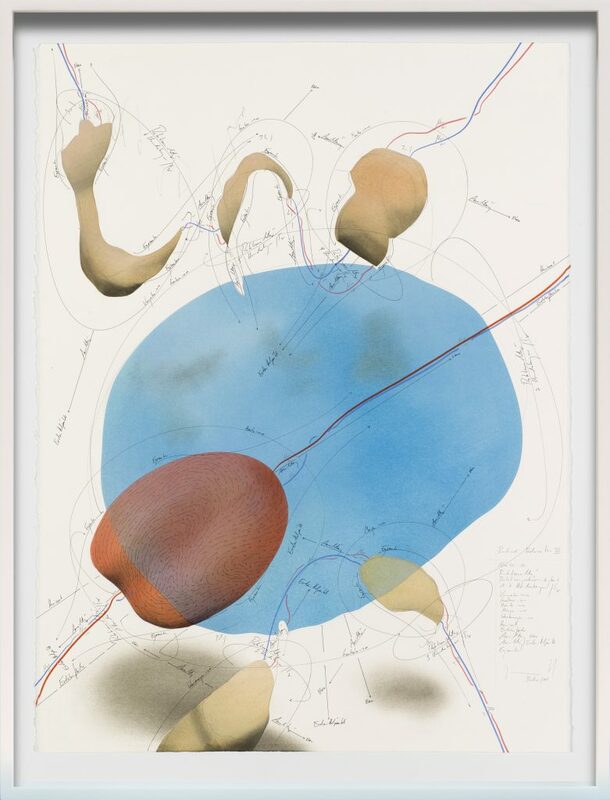 These areas of water are complemented by brownish areas derived from contour drawings of the contact areas of the artist’s body left on the paper stretched out over the floor. Voigt first used these self-referential elements in the series Inkommunikabilität [Incommunicability] (2014) in an attempt to put on paper the point of contact between body and space. Thus it is only logical that these forms, in which one can sometimes sense individual body parts like a knee or an elbow, should reappear in Radical Relaxation, since they are, after all, the result of an intensive engagement with the concept of the subject and with the artist’s own being. Red objects with surfaces made up of currents of arrows recall the organs from Ach so!, and likewise red and blue ‘now’ lines once again snake their way over the sheets, cutting across or hesitantly encircling the expanses of water. In this series, Voigt takes stock of those things that calm today’s human beings – gazing at water, into their own bodies, reflecting on their selfhood. Yet the absence of restlessness and stress equally implies their existence, which Voigt attempts to visualize in her two works Jetzt keine Zeit [No time now] and Jetzt geht nicht [Not possible at present]. The sometimes overwhelming simultaneity and activity of numerous diverse bodies, objects or colours can also trigger restlessness and bewilderment. In the current exhibition, Jorinde Voigt’s works tell us a good deal about our being in the here and now, while at the same time they permit fields of association with etiological phenomena from the past, present and future. 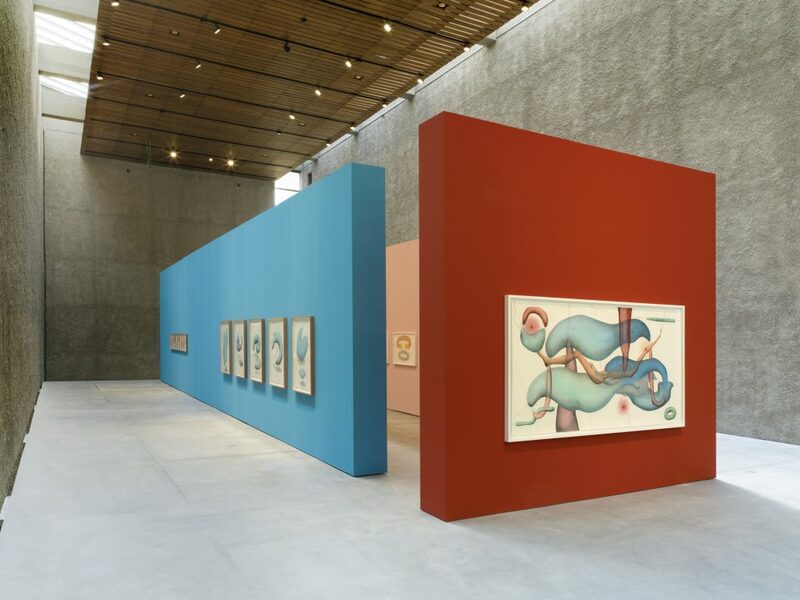 The beholder is forever moving between the two poles of archetypical, traditional images and of individual experience – be it his or her own or that of the artist. © VG Bild-Kunst, Bonn 2016.